I like the big bold MIA color. Yeah! For MIA! Love these. I really like the MIA find. Awesome! Great for the nautical them. MIA does it so well. Love this shoe from Zappas. What a great summer wedge. I can't believe we're looking at espadrilles, it seems like we should still be on the boots! I'd pick the Mia's, bring on summer. I'm just loving those Tory Burch wedges! 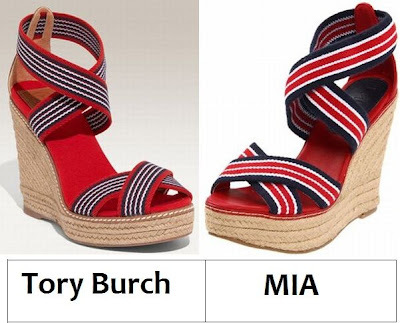 I adore the boldness of the MIA shoes in contrast to the Tory Burch ones! I had been lusting over these shoes...so happy for your great find!! MIA definitely works for me!!! another stellar comparison. I adore MIA sandals! And I Love the color. Perfect for summer! I actually like the color shade of the MIA a bit better. So why not save a few bucks? I love the color combo! It's perfect! Gotta go with the Tory Burches every time! Great find! They are both super cute! I absolutely love those. I need them for summer. I love the Tory Burch ones. hmm, even though they're really similar, i think i like the Tory Burch pair more than the MIA. i think it's the thick striped lines that are making me now like them. Mentally planning numerous outfits that those adorable Tory Burch's would go with! !